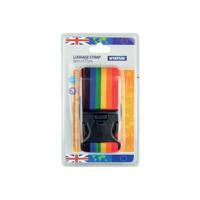 Easily identify your luggage with the help of a multi-coloured luggage strap. This pack of three will help to keep your luggage secure with an adjustable design that comes with an identification tag. Made from strong web material, the straps feature secure three-point clips and will adjust from approximately 98cm to 177cm.